The White House announced Thursday that former U.S. Ambassador to the United Nations John Bolton will replace Lt. Gen. H.R. McMaster as President Donald Trump's national security adviser. The personnel switch was part of an ongoing plan between Trump and McMaster, and the outgoing adviser with retire from the Army during the summer, the White House said in a statement. McMaster's work was being made difficult as a result of retirement rumors that undermined his discussions with foreign leaders; therefore, McMaster and Trump decided to accelerate his departure, the New York Times reports. McMaster released a statement thanking Trump and his colleagues. "After thirty-four years of service to our nation, I am requesting retirement from the U.S. Army effective this summer after which I will leave public service," McMaster's statement read. "Throughout my career it has been my greatest privilege to serve alongside extraordinary servicemembers and dedicated civilians." "I am thankful to President Donald J. Trump for the opportunity to serve him and our nation as national security advisor. I am grateful for the friendship and support of the members of the National Security Council who worked together to provide the President with the best options to protect and advance our national interests," McMaster's statement continued. "I am especially proud to have served alongside the men and women of the National Security Council Staff who established a strong foundation for protecting the American people, promoting American prosperity, achieving peace through strength, and advancing American influence. I know that these patriots will continue to serve our President and our nation with distinction." Trump also released a statement praising McMaster's service in both the Army and as his national security advisor. "H.R. McMaster has served his country with distinction for more than 30 years. He has won many battles and his bravery and toughness are legendary. General McMaster’s leadership of the National Security Council staff has helped my administration accomplish great things to bolster America’s national security," Trump's statement said. "He helped develop our America First National Security Strategy, revitalize our alliances in the Middle East, smash ISIS, bring North Korea to the table, and strengthen our nation’s prosperity. This work and those achievements will ensure that America builds on its economic and military advantages. I thank General McMaster and his family for their service and wish them the very best." Bolton received a recess appointment to be Ambassador to the United Nations from then-President George W. Bush and served in that position from August 2005 to the end of 2006. 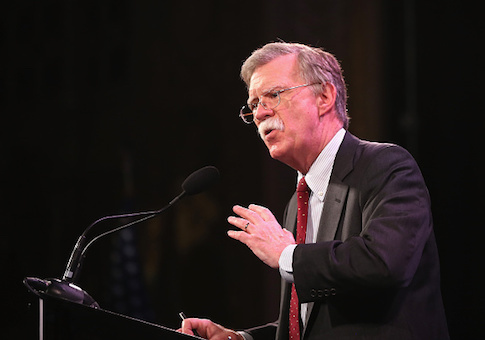 Bolton is well known for his conservative stance on military and foreign relations matters. Bolton will become Trump's third national security adviser. This entry was posted in National Security and tagged H.R. McMaster, John Bolton, National Security Adviser, President Trump, White House. Bookmark the permalink.